Perhaps the most internationally famous and prolific female artist of the 18th century, Kauffman was a child prodigy. She was born in Chur, Switzerland but grew up in Schwarzenberg, Austria where her father, Johann Joseph Kauffman, also a painter, encouraged his daughter to hone her musical and artistic talents. When Kauffman’s mother, Cleophea Luz Kauffman, died in 1757, Kauffman decided to give up her music and devote herself to painting. Throughout Kauffman’s life she traveled extensively. In 1764 Kauffman moved to Rome. At this point in her life she was already famous. On a trip through Venice she met Lady Bridget Wentworth Murray who encouraged her to come to England. Kauffman moved to London in 1766 and by 1768 had become a founding member of the Royal Academy. 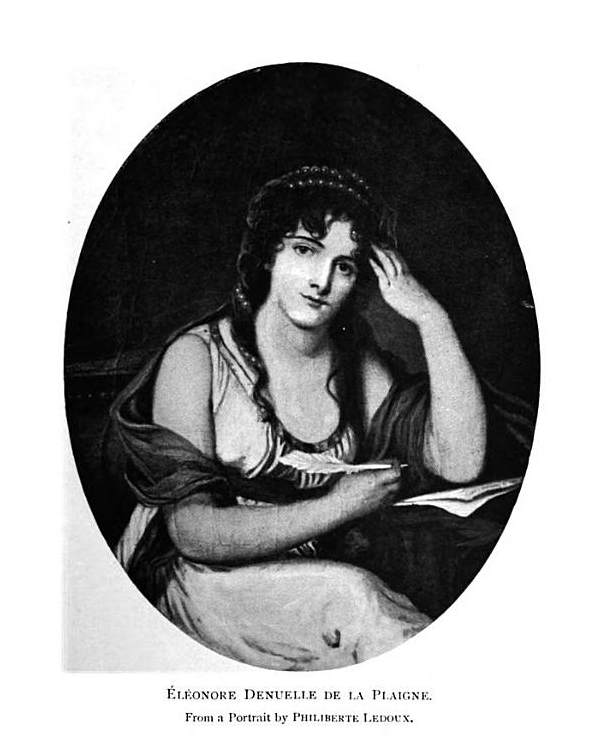 Her fame made her ripe for scandalous talk and she also became acquainted with many other famous people of her time including Goethe (1749-1832), who was a close friend. Her first marriage, which was annulled, was to a bigamist, and her second marriage in 1781 was to Antonio Zucchi (1726-1795), also a painter, who gave up his career to run Kauffman’s affairs. Sources: Natter, Tobias G., ed. 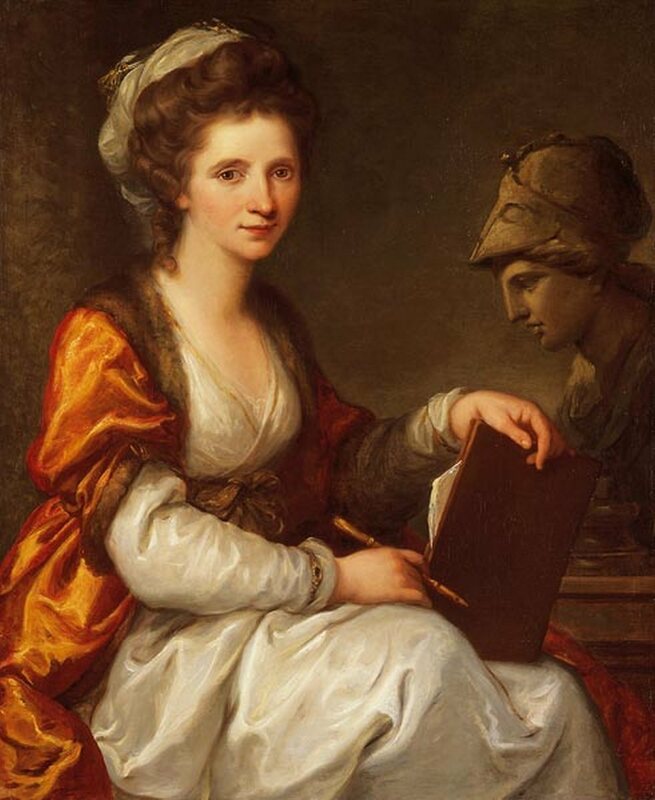 Angelica Kauffman: A Woman of Immense Talent. Germany: Hatje Canz Verlag, 2007. Rosenthal, Angela. 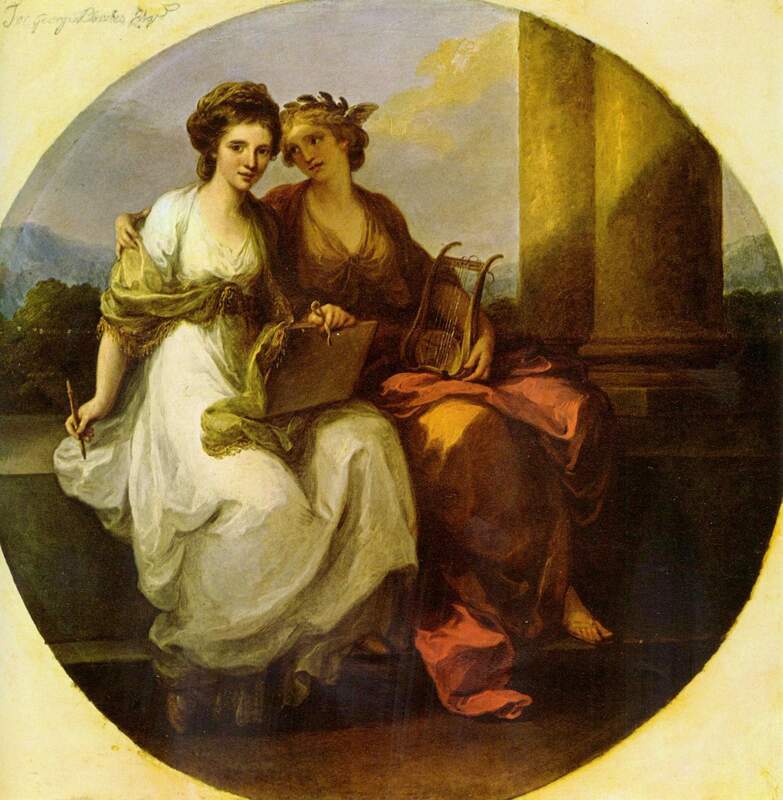 Angelica Kauffman: Art and Sensibility. New Haven: Yale Press, 2006. 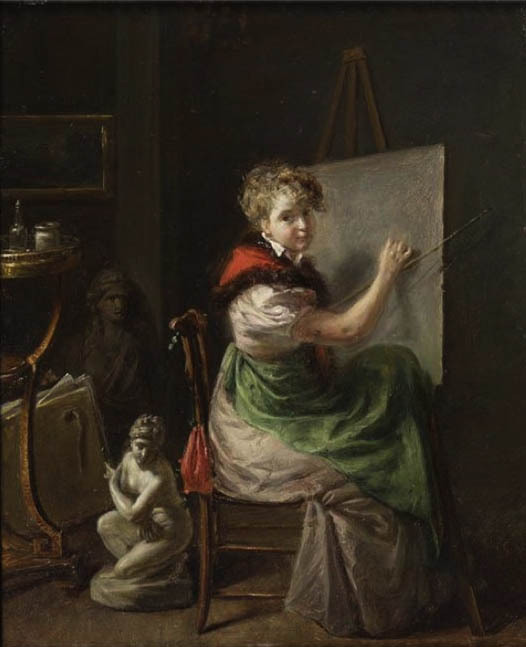 A lesser known contemporary of the popular Louise Élisabeth Vigée Le Brun (1755-1842), Philiberte Ledoux was born in Paris in 1767 and never married. According to the Chronique Des Arts et de la Curiosité, she may have been the daughter of painter Paul-Guillaume Ledoux who died in 1781. She is known to have participated in the Salons of 1793, 1796, 1799, 1802, 1804, 1805, 1808, 1810, 1814, and 1819 in Paris. 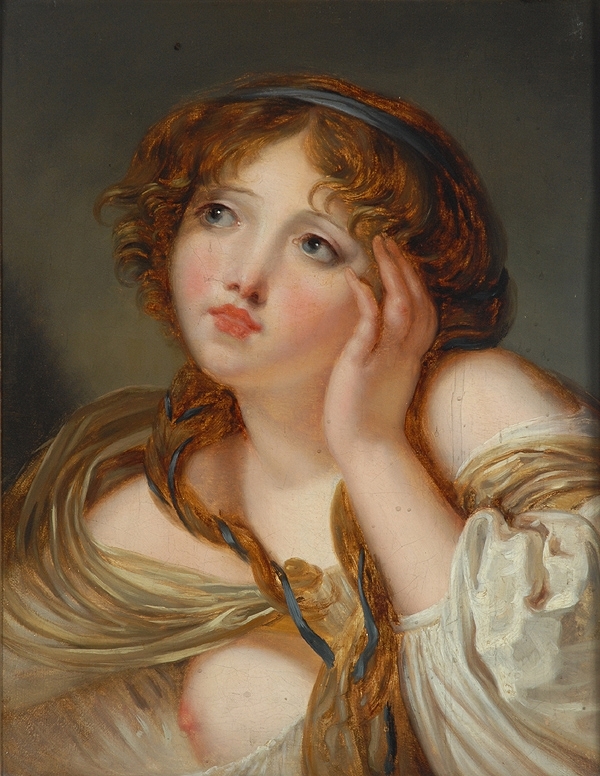 Although she did not attend an academy, she did study under French painter, Jean-Baptiste Greuze (1725-1805), who was educated at the Royal Academy in Paris. Philiberte Ledoux was mainly known for her paintings of women and children who were depicted in 18th century French styles. While history does not seem to remember much about her, she must have a been an artist of some repute, because she is cited as the painter of a portrait of Elénore Denuelle (born Louise Cathreine Elénore Denuelle de la Plaigne 1787-1868) who was the mistress of Emperor Napoleon I of France (1769-1821). It is alleged that Denuelle had an illegitimate child with Napoleon I. This child acted as proof that Napoleon I was not impotent and led to his divorce of Joséphine de Beauharnais (1763-1814). Philiberte Ledoux died in the neighborhood of Belleville in Paris in 1840, but many of her paintings are extant, several of which hang in the Bowes Museum in the town of Barnard Castle in Teesdale, Durham, England. — Kristin Bell, 2012. Chronique Des Arts et de la Curiosité: Supplément a La Gazette Des Beaux-Arts, vol. 3 (1865): 331. Evans, Howard V. and Charlotte B. Evans. “Women Artists in Eighteenth-Century France.” Man and Nature/ L’homme eet la nature, vol. 1 (1982): 199-207. Fleischman, Hector. An Unknown Son of Napoleon. New York : John Lane Company, 1914.